Feinberg, 22 at the time, was in shock and disbelief. 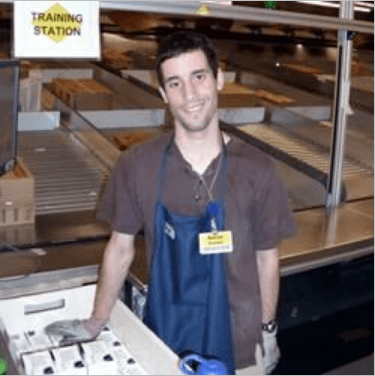 “When I asked why, he said “because you are Jewish, and the best chances of a match are people with the same genetic background.” There were no family members who were potential matches, and at the time, Jews were not well-represented among potential donors. 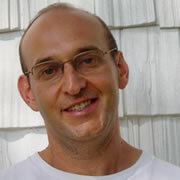 Feinberg survived the harrowing journey, remains in good health, and has devoted his life to helping create “The Gift of Life Marrow Registry,” which seeks to educate people about blood cancers, and to increase the numbers of Jews and people in general around the world to bone-marrow registries. By 1995, more than 60,000 people had been tested. Currently, 310,833 people are registered donors; 15,409 matches have been made; and to date, some 3,321 transplants have been facilitated. 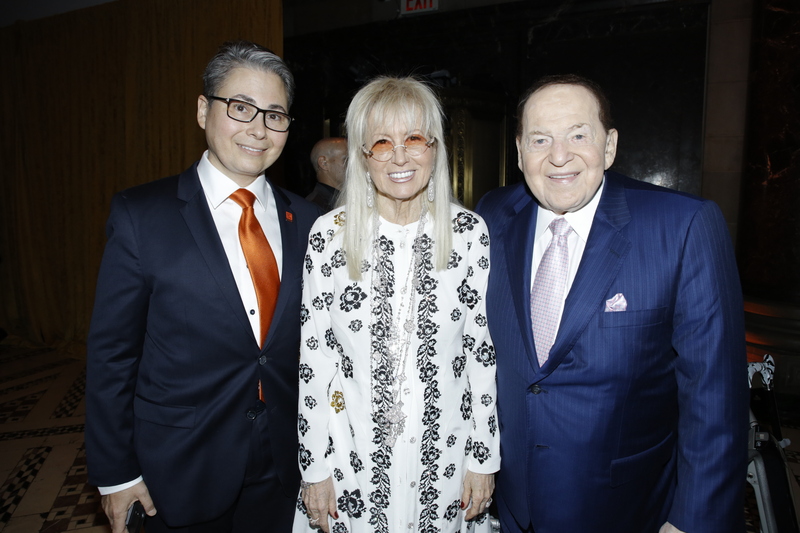 The Oct. 10 Gift of Life Gala raised $9.5 million, and honored Dr. Miriam and Sheldon Adelson with the Partners for Life Award. It was an emotional affair, featuring a swab table, and moving stories of donors and recipients. 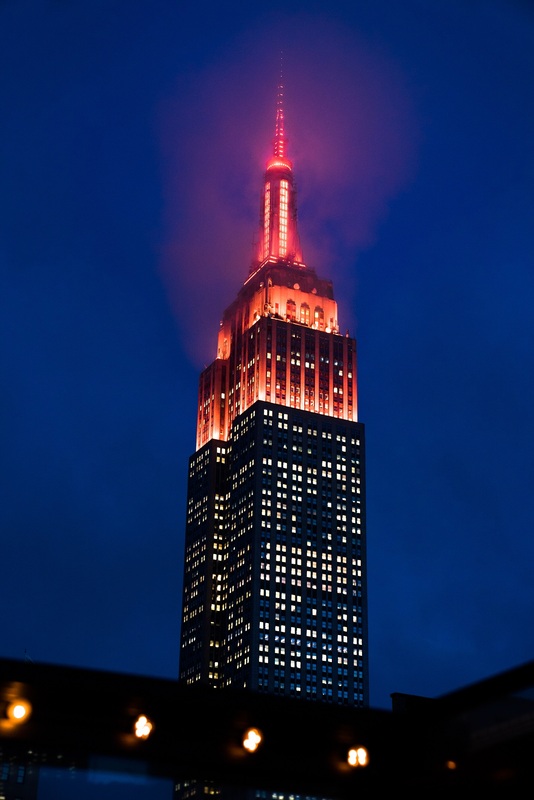 To mark the gala, Gift of Life’s orange brand color lit the peak of the Empire State Building and Renaissance Clock in Times Square on Wednesday night, while the Helmsley Building at 230 Park Avenue glowed orange on Tuesday. Gift of Life Marrow Registry founder and CEO Jay Feinberg (left) with Gift of Life Marrow Registry Partners for Life Award honorees Dr. Miriam and Sheldon Adelson. Credit: David Nicholas Photography. Guests were greeted by Gift of Life staff member Lindsay Katz and the table with swab kits. She explained the simple directions of how to join the registry by downloading SwabApp, completing a few forms and a cheek swab. “When I was 10, my 11-year-old cousin went through this and responded to medicine. I have been involved with Gift of Life ever since,” she said. 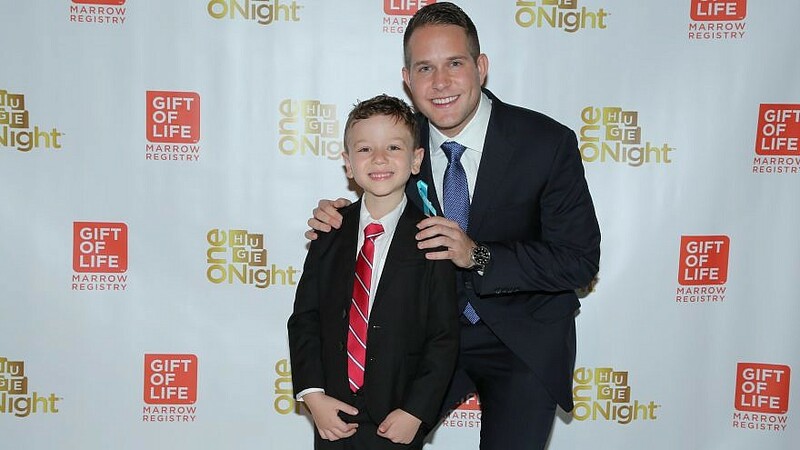 Isaac Zablocki, senior director of film programs and the Israel Film Center at the Marlene Meyerson JCC Manhattan, attended with his wife, Aviva, to witness his 6-year-old nephew, Idan, as he met his donor, Alex, for the first time. “I am prepared with tissues,” revealed Aviva Zablocki during the cocktail reception. The Empire State Building in New York City displays the Gift of Life Marrow registry colors on Wednesday night, Oct. 10, 2018. Credit: Andrew Tess. While the crowd was inspired by the Adelsons’ commitment and philanthropic generosity, the true heroes of the evening were the donors and recipients. Idan, of New York City, who battled the potentially fatal immune deficiency Hyper IgM Syndrome (Hyper IgM), met his stem-cell donor, 22-year-old Alex Weiss, a New York financial analyst originally from Fort Lauderdale, Fla.
Weiss presented Zablocki with a jersey from University of Michigan, his alma mater, and a teddy bear. He also made a donation to Gift of Life. Psychologist Jon E. Perlman, 69, received his diagnosis just before Passover, referring to it as “the 11th plague.” Perlman, who battled Acute Myeloid Leukemia, met his stem-cell donor, Seth Benzell, 27, of Allston, Mass., a research associate at the Massachusetts Institute for Technology’s Initiative on the Digital Economy. The two noted living just 20 minutes from each other in Massachusetts. 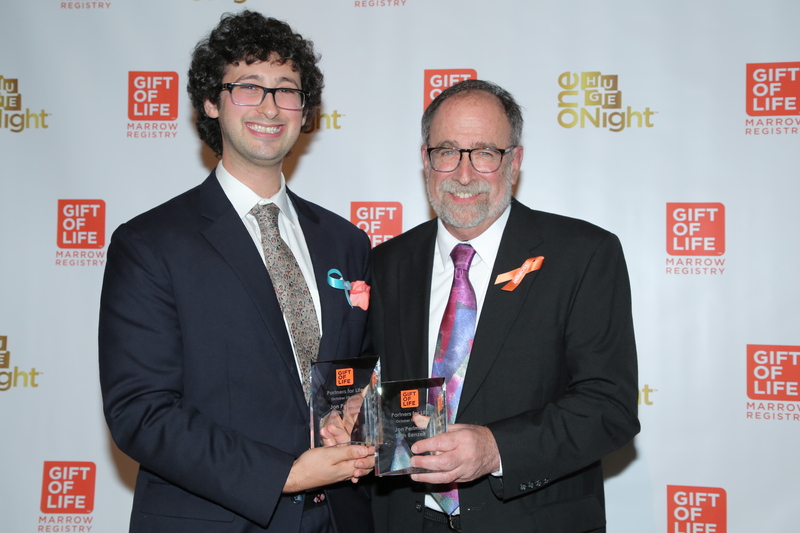 Benzell also joined Gift of Life during a Birthright trip. Gift of Life Marrow registry donor Seth Benzell of Allston, Mass. (left) and recipient Jon Perlman of Sudbury, Mass. Credit: David Nicholas Photography. The Adelson Family Foundation has enabled thousands of new donors to join the registry through Birthright Israel, resulting in more than 1,600 potential matches that have led to 209 transplants so far. Thomas Stern, chairman of the board of the Birthright Israel Foundation, noted that Benzell is “No. 200”—the 200th Birthright participant out of 214 who have thus far donated marrow to people with blood cancer. “We will do 25,000 swabs this year out of our 50,000 participants. We could do 100 percent if we had an extra $1.5 million annually,” declared Stern. Gift of Life’s expansion plans include relocating to a new larger headquarters in Boca Raton, Fla. 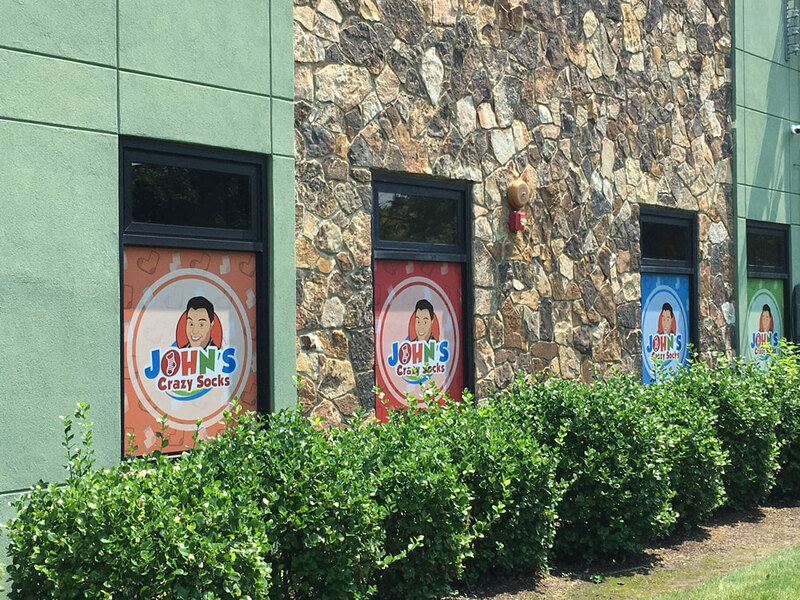 The new offices will include an on-premises stem-cell collection center. The organization recently opened an office in Jerusalem to support its collaboration with Birthright Israel. Efforts also continue to expand the registry for currently underrepresented populations.